Anyway, hope you'll like it ! I don't know who I'll draw next... Any suggestion is welcome ! Your style is so unique, I am absolutely IN LOVE with it. 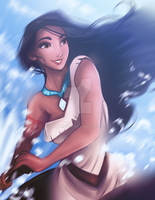 And the fact that you have Pocahontas (it seems like Disney doesn’t even consider Pocahontas a Disney princess.............. and she’s my all time favourite) makes me love your art EVEN MORE. Keep up your amazing work. It’s beautiful. So pretty, I cant wait to see the other girls! I love this movie, thank you for reminding me! This is so pretty, I love how elegant she looks here and the outfit looks beautiful on her...lovely! Reminiscent of Mary Blair - minimalist, yet loaded with character, solid composition and design, great use of color. 10/10! And have to say... I didn't know Mary Blair. But now, thanks to you I know her, and I really love her work, it's really inspiring ! Is there anyway I can buy this? Les couleurs sont vraiment jolies, j'aime beaucoup le contraste entre Pocahontas/les feuilles aux teintes chaudes, et le reste du décor en teintes froides, c'est super ** !